Here on the Hackster blog, we’ve covered a lot of insect-inspired robots. They’re small, light, and have a lot of future potential for applications where a robot needs to fit into tight spaces, like search and rescue. But, for the time being, they really don’t work that well. In almost all cases, either the processing or power needs to be offloaded, which means the tiny robots are constrained by a tether. Researchers from the University of Connecticut are now trying a different approach, and have been able to remotely control cyborg cockroaches. Their experiments take advantage of the biology of Madagascar hissing cockroaches, which already possess the motor functions and on-board “power” that is so difficult to implement in a tiny robot. Instead of trying to build a state-of-the-art micro robot, they’re utilizing what nature has already provided. Strapping a “backpack” full of sensors onto a cockroach is simple enough, and has already been done by others. But, actually controlling the cockroach is a different story, and that’s why this research stands out. Cockroaches navigate using their antennae to determine when they’ve encountered an obstacle. This system adds electrodes to the cockroaches’ antennae lobes, which can provide a small shock to make them turn left or right. Theoretically, a small heater can also be added to backpack to encourage the cockroaches to move forward, because they’re more active when it’s warm. That miniature backpack also includes a 9-axis IMU (inertial measurement unit) and a Bluetooth module. The IMU lets the researchers determine where the cockroach is moving, and the Bluetooth module lets them receive sensor data and send steering commands. 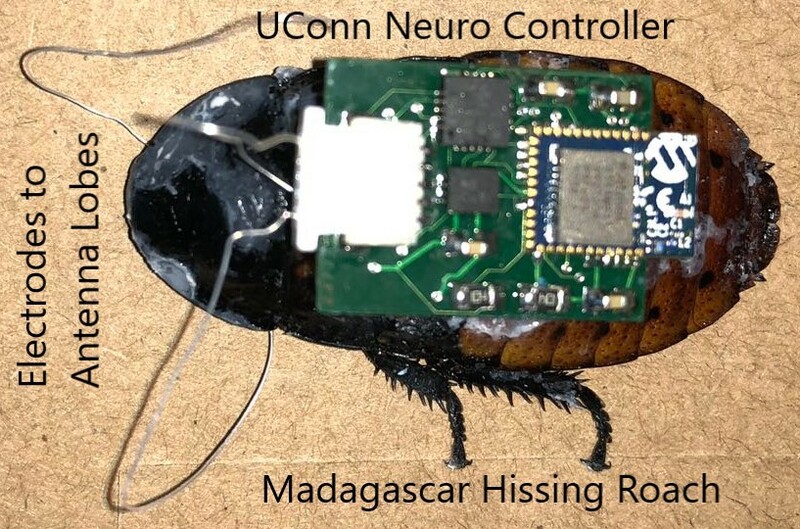 UConn Researchers Use Bluetooth to Steer Cyborg Cockroaches was originally published in Hackster Blog on Medium, where people are continuing the conversation by highlighting and responding to this story.